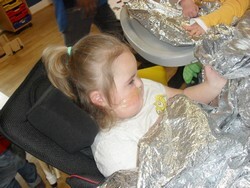 Please take a look at this video for a rounded insight into our playgroup for children with special needs. 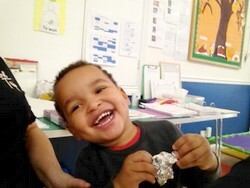 Meet the children in their playgroup environment and hear from the professionals, volunteers and parents. The video lasts just under 7 minutes. Marlow Opportunity Playgroup offers a secure, relaxed and happy environment where pre-school children with additional needs learn through structured play and exploration. Irrespective of their differences, children's individuality is valued and nurtured in order for them to achieve their potential, within a parent-involved setting.
" We would be lost without this playgroup "
Ofsted Inspections: 2011 - Outstanding 2011 Report (.pdf) , 2015 - Outstanding 2015 Report (.pdf) . 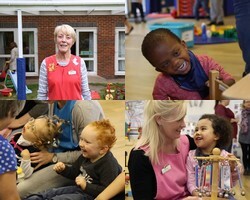 These first three videos have been recorded by members of the Marlow Opportunity Playgroup community. This BBC One Show video is of a visit by Matt Baker (and Pudsey Bear). Matt chats with the playgroup leader and some parents to give an overview of how the playgroup helps the children and their parents. Ofsted registered and rated 'Outstanding'. "A truly fantastic playgroup which gives parents of children with complex needs a sense of relief ... "
Opening times, Term times and session fees. Latest Messages, Newsletters, Events & Links to documents and information. MOP is extremely grateful for the continued support of these local companies and suppliers. How to Contact or Find Us. Please help us to continue with what we do. Visit this page for Bank and Gift Aid forms, Donation and Sponsorship links.